I am oh-so-excited about today's post! First off- I just cannot get over the amazing natural lighting in these photos! Lately I have been very inspired by the fashion blog Gal Meets Glam by blogger Julia Engel. If you aren't familiar with Gal Meets Glam, Julia's husband Thomas does all of her photography, and he always captures Julia in the most beautiful natural light! I guess this post was my attempt of being inspired by their photography. 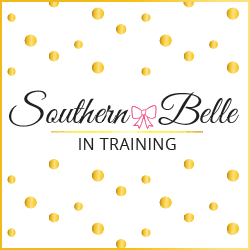 :-) This is also the second week of my summer series, Southern Belle in the 'Bunk. More on the location of this post later, but first for the outfit details! This was the second dress that I was able to score on Pink Sunday during the Lilly Pulitzer for Target launch! (I featured my other shift dress in the #LillyforTargetLinkUp that my blog bestie Michaela and I held a few weeks ago!) Despite being a self proclaimed girly-girl, I don't own that many clothing pieces that are this pink! So I was excited to score this Lilly dress at Target and bring a little bit more pink cheer into my closet. Like my other Lilly for Target dress, I was very impressed with the quality of these shifts for the price, and I thought that they fit well! In the first week of Southern Belle in the 'Bunk, I did my blog shoot on the bridge over the Mousam River, one of two rivers in Kennebunk. When looking at a map of town, one can see that the Mousam River runs through the Southwestern part of town, and other river, the Kennebunk, is Northeastern of the Mousam (#geographynerd). Both rivers end up coming to meet the sea within just a few miles of each other though! I thought that it would be fitting for this week's pictures to be taken where the Kennebunk River comes to meet the sea. I did them in two locations: one on a bridge similar to the bridge that I shot at on the Mousam River, and the later pictures in a small field with beautiful flowering trees near the banks of the river between Kennebunk and Kennebunkport. Katie took these pictures for me right at sunset, and I already said this, but the natural lighting was truly incredible! P.S. Since my dress was sold out, I have linked instead some similar pink shift dresses from the regular Lilly website below! You are gorgeous. The dress is gorgeous. Your makeup is gorgeous. The location is gorgeous. I love this post! You seriously look so gorgeous!! I totally see the inspiration from Gal Meets Glam, it's one of my favorite blogs too! Can we just talk about how stinkin' LUCKY you are to have snagged a LP for Target dress??? And you're rocking it. You go girl! I love Gal Meets Glam! Also, the view is gorgeous and I am in love with the way the photos came out. You are way too pretty. Adorable Lilly dress! So lucky to have gotten it on sale, they were sold out so quickly! How beautiful! I love your dress! I'm loving this series so far! I know we've talked about it before, but its nice to see more of fashion blogger than just her outfits! PS - you and your bestie look like you're having the best time!! Honestly. Just when I thought you couldn't get any prettier. I love you mucho! I'm so sorry - I'm so bad with my emails... call me this weekend and we'll talk instead of email!! This dress is everything. I love all of the photos. You and Katie are too adorable! Gorgeous! This definitely reminds me of Gal Meets Glam!! So pretty! And that location is perfect! You look lovely in that shade of pink! I'm also loving learning about your hometown, I know nothing about Maine so it's fun to learn about. Natural lighting in photography is hard to get, good photography is hard to get... You hit it out of the park with both! Have a great weekend! Such a pretty dress, and I love your pictures!! 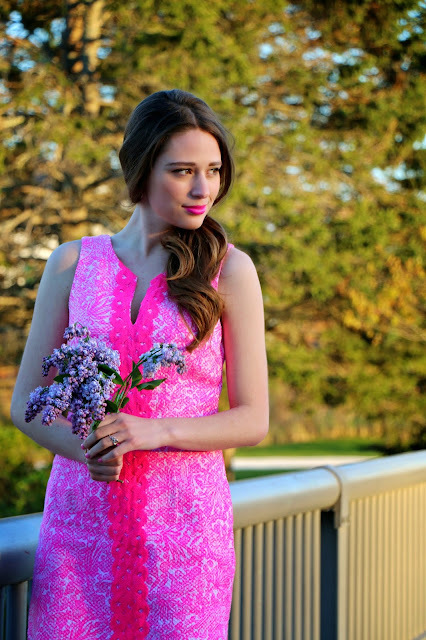 I haven't had a Lilly dress since I was little, but this one looks so good on you, I may have to get one again! That dress is definitely one of my all-time favs from Lilly! Such a cute design, and you look absolutely beautiful! I absolutely love the See Ya Later shift, it was one of two shifts that I was lucky enough to snag and I was so glad I did!